The Ambassador–Designate of the United Arab Emirates to the Republic of Maldives, His Excellency Dr. Saeed Mohamed Ali Al Shamsi, presented his credentials to President Ibrahim Mohamed Solih at a ceremony held this afternoon at the President’s Office. During the call that followed immediately afterwards, the Ambassador remarked on his government’s keenness to enhance trade and cooperation between our two countries. He expressed that he was particular eager to strengthen collaboration in the tourism sector, partly by increasing flight connectivity. 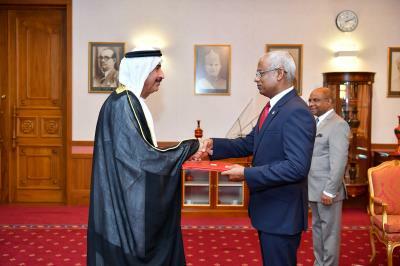 The President further congratulated the Ambassador on becoming the first resident Ambassador of the UAE to the Maldives. The Ambassador thanked the government, and the Ministry of Foreign Affairs in particular, for their extremely helpful assistance throughout the ongoing process of finding a suitable permanent chancery. At the call’s conclusion the President congratulated the Ambassador on the commencement of his term. The Ambassador in turn expressed his gratitude for the extremely welcoming reception he has been given since his arrival in the Maldives, and his positive expectation that the friendship that exists between our two countries will be further cemented in the years ahead.